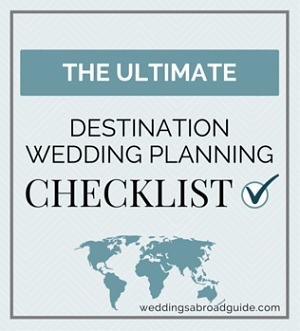 Use my Wedding Abroad Planning Checklist to help make planning your destination wedding just that little bit easier. 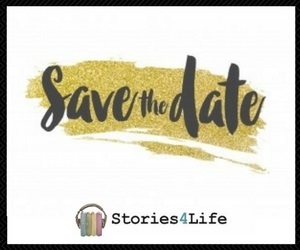 I have not structured the wedding planning checklist in the traditional timeline manner as I know that everyone works to different timescales. Instead I have tried to group like items together and include prompts which I hope will make planning your wedding abroad a little easier. Also to make it a little easier you can download the checklist in PDF format. Just fill in your details below for instant access. Select your wedding abroad destination. For hints and tips on choosing the perfect wedding abroad destination click here. Contact the Foreign Embassy or Consulate to confirm the legal and residency requirements to get married in the country of your choice. Understand the timeframe and the steps that must be completed to ensure your marriage can take place. Decide what time of year you would like to get married and select a preferred date. For hints & tips on selecting your wedding date click here. Think about who you would like to spend your wedding day with and compile a guest list. Speak to guests as early as possible in order to estimate the numbers that may attend. 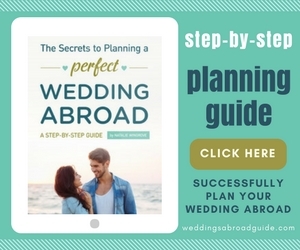 This will help when speaking to Wedding Planners, Tour Operators, Suppliers and choosing your wedding venues. 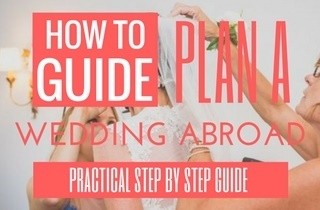 For hints & tips on inviting guests to a wedding abroad click here. Determine how much you would like to spend on your wedding. Prioritise the different components of your wedding. For example is it more important to have a great photographer than a string quartet? Determine the style of wedding you would like to have and how much involvement you would like to have in its planning. 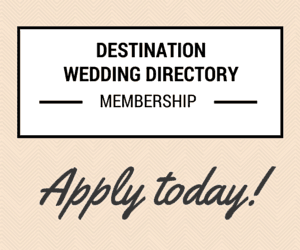 Decide if you would like to use a Wedding Planner, Tour Operator or plan your wedding yourself. Decide if you will have a rehearsal or pre-wedding day dinner. Decide if you will have a post wedding day breakfast or lunch. If you are holding extra celebrations investigate and book appropriate venues. Decide if you will organise group sightseeing activities. Investigate possible activities. Decide if you will have a party upon your return home. If yes, add this to your budget, compile a guest list and investigate and book venue. When getting married abroad most couples hold extra activities and celebrations. For further information click here. 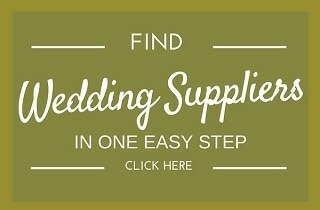 Following is a list of the typical suppliers you may need to book or use for your wedding day. Determine what type of ceremony you would like to have Civil, Religious or blessing. Determine if it is possible to have this type of ceremony at your chosen wedding destination. Determine where you would like to hold your ceremony and if this is possible. E.g. beach, reception venue, garden. 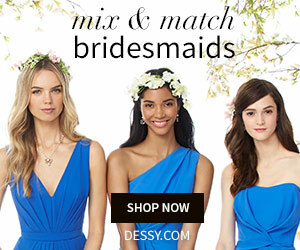 Determine what customs and traditions you would like to incorporate into your wedding ceremony. Choose the music for your ceremony. Choose readings for your ceremony. Choose or write your vows. Choose and ask guest(s) to do reading(s). For further information on having a Civil Wedding Abroad click here. For hints & tips choosing your ceremony venue click here. Determine what type of reception you would like to have. Formal, casual, outdoor etc. Think of the type of reception venue that would best compliment the style of wedding you have chosen. Decide what time of day you would like to have your reception. Daytime or evening? Decide if you would like to have music at your reception. Determine what type of music you would like and when this should be played. Decide what type of wedding meal you would like. Formal sit down, buffet or cocktail reception. Determine if you would like to have hors d’oeuvres before the main meal. Determine how many courses would you like to have. Note: this may vary according to the cultural traditions of the country you are getting married in. Will you have speeches? Who will give the speeches? When will they take place? For hints & tips choosing your reception venue click here. For hints & tips on selecting a wedding dress for abroad click here. For hints & tips on Wedding Abroad Invitations click here. Investigate and select a range of suitable accommodation for your guests. Ensure you find accommodation that caters for all budgets. Ask hotels if they will offer a special rate for your guests. Confirm what date your guests must book by to secure accommodation. Determine if a deposit must be paid. Will this deposit be refundable if a guest does not use the accommodation? Determine if a hotel will be willing to put information in your guests’ rooms e.g. welcome letters & gifts. Decide if you will book accommodation on your guests’ behalf or ask your guests to book their own accommodation. If your guests are going to book their own accommodation, compile a list of recommended hotels to go in their information pack. Be sure to mention any special rates and booking reference codes. Ask the hotel if they provide airport transfers. Provide your guests with this information in their information pack. Determine where you guests are staying & when they arrive and depart. 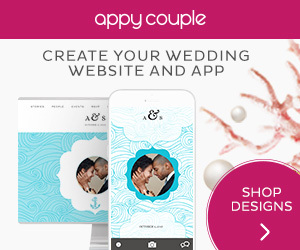 Compile information pack or set up a wedding website. This information should be given to guests with their invitations. 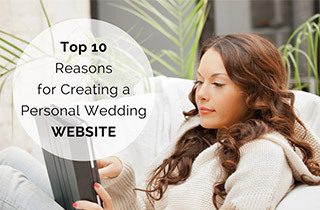 For the type of information you should include in the pack or on your wedding website click here. Write a wedding welcome letter to put in your guests’ hotel rooms. This is a nice surprise for your guests and a good way of re-iterating the itinerary for your celebrations. Write guest place names for your wedding reception. 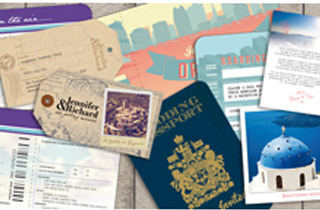 Investigate what airlines fly to your wedding destination. Ask airlines if they offer discounts for group bookings. Ask chosen airline if you can bring your bridal gown on as hand luggage. Determine what your luggage limit is. Note down when your guests will arrive and depart your wedding destination. Book transfers to and from airport. Book transportation for bridal party to and from wedding ceremony. Book transportation for bridal party to and from wedding reception. Determine if you will need to book transportation for any extra activities and celebrations for you and your guests. Plan the order of your wedding day. It is really important that you have a timetable for your wedding day. You and your guests will need to know what should happen when. If you are not using a Wedding Planner or Tour Operator it is an idea to hand over the responsibility to a guest – this way they can ensure everything happens when and how it should as you don’t want to be worrying about this on your wedding day. Record your marriage in your home country, if desired. If changing your name, change all necessary documentation. Clean & preserve wedding dress. 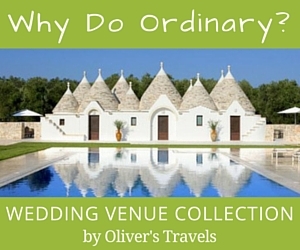 Tell Weddings Abroad Guide all about your day. I have created a “Closed” Facebook Group where you can meet other couples getting married abroad, and ask advice from all the fabulous wedding suppliers featured. You will be able to discuss your wedding plans, ask questions, get inspiration from other couples and from wedding suppliers and make sure everything is covered on your wedding planning checklist. 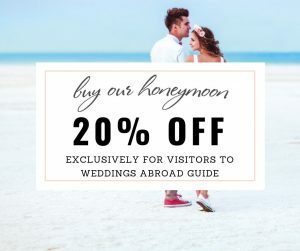 Find Wedding Abroad Suppliers in One Easy Step. 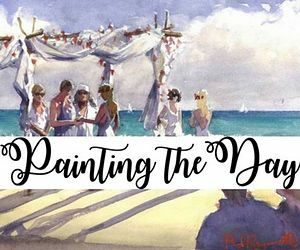 I would love to hear your feedback on the wedding planning checklist. 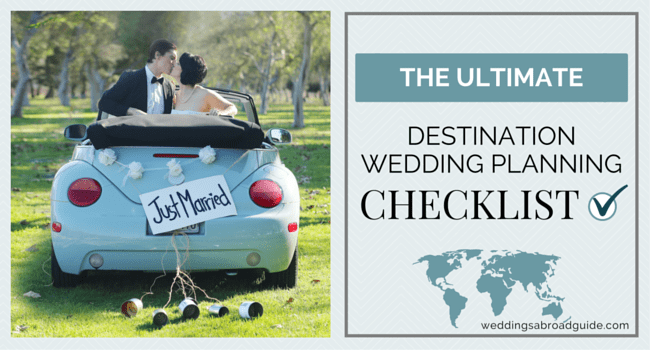 As every wedding is different, can you help me make the checklist more robust? Is there anything else you think should be included? 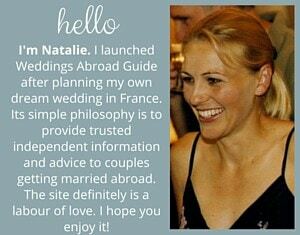 If so, please contact me so we can create a really useful tool for everyone getting married abroad.